I'm very impressed with this filter. The moon was high last night but the seeing was dodgy on account of the jet stream and god knows what else. I dispensed with the ADC and any barlow and just screwed this little filter onto the nose of the 224 colour cam. I got good focus with the moonlite focuser. I also got to try out the counterweight for the CPC-1100 which helps A LOT. 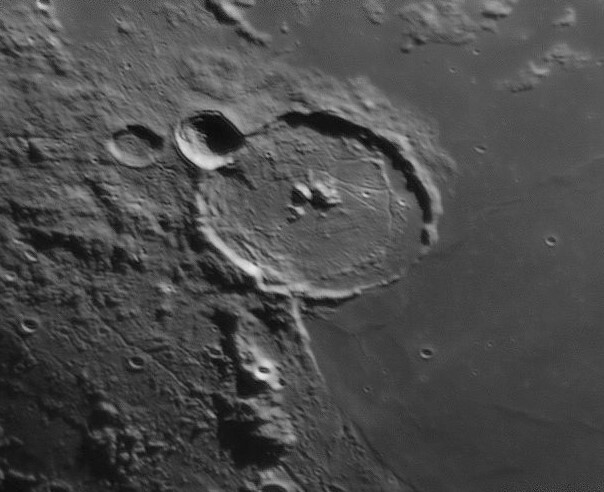 I'm really blown away with these shots, as they are a marked improvement on any other lunar work I have managed in the last 2 years. I'm also assuming my collimation is "good enough" as I haven't had the chance to check it out since before Christmas. They're great filters eh? I wouldn't be without mine. So useful. Will even give you a chance of getting something decent on Jupiter/Saturn with them way down in the muck. Wow I like what I am seeing. No pun intended. This is excellent work! I did not realize that atmospheric error was so greatly reduced above 800nm. You have me wondering if I can somehow use my 900nm dslr filter in conjunction with my asi290. Edited by calypsob, 18 March 2019 - 09:26 AM. If I've named anything incorrectly, please let me know. I'd be keen to know the names of those mountains in the last pic. All in all it was a very enjoyable 90 mins or so capturing and then the few hours today processing them. Firecapture, AS!3, R6 and a very mild touch up in Windows Photos. I used the latter to render them as black and white images as for some unknown reason the colour mixing tab in R6 remains minimized in spite of reinstalling as a last resort. For me anyway, it goes to show you don't need to much cooking if the ingredients are good. I see some fabulous shots here on CN dubbed "Hi-Res" and I'd like to think some of these are comparable. While I'm attributing the quality to the 807 filter, it's of course impossible to say to what extent it has actually helped, short of imaging simultaneously with a similar rig sans filter side by side, but I'm 99.9% confident it has helped immensely in steadying the seeing. Thanks for looking. Comments and suggestions, criticisms and what-not most welcome. Nicely done Kevin. I can see the improvement in your imaging techniques. Keep up the good work! That's for sure, Limpet (sorry, can't remember your actual name). Amazing that a very expensive few square centimetres of glass can have such an enormous influence on ameliorating the seeing conditions. I probably would have fallen off my chair had I not been lying down while processing these (well, slouching on a sofa). Thanks for the heads up on this filter. After this, is there anything else you'd recommend? I'd get a 610 baader if you dont have one, or a 685. You may not have noticed but the price you pay for the excellent seeing with the 807 is the slight loss of resolution. You get better resolution with the 610, albeit not quite so much insensitivity to poor seeing. Its good to have a quiver of filters. The 610 is also excellent for uranus/neptune. The 807 is just too dark with those two. Nice progress, Kevin. Alas, as Nick has already reminded us, 900nm is almost twice the 'standard' 550nm, so you're losing almost half the potential resolution in this manner. You didn't mention what kind of extra amplification you used, but if it's zero, then you're likely at about 1/4 of the potential resolution for your equipment. 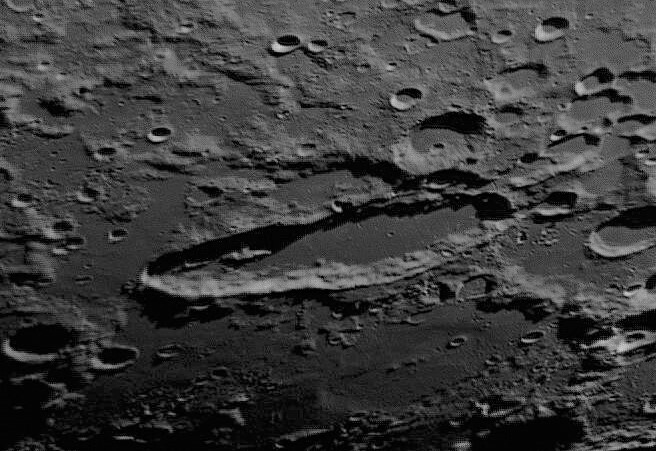 This is perhaps most noticeable in Plato and Clavius, which both appear rather on the smooth side, above. 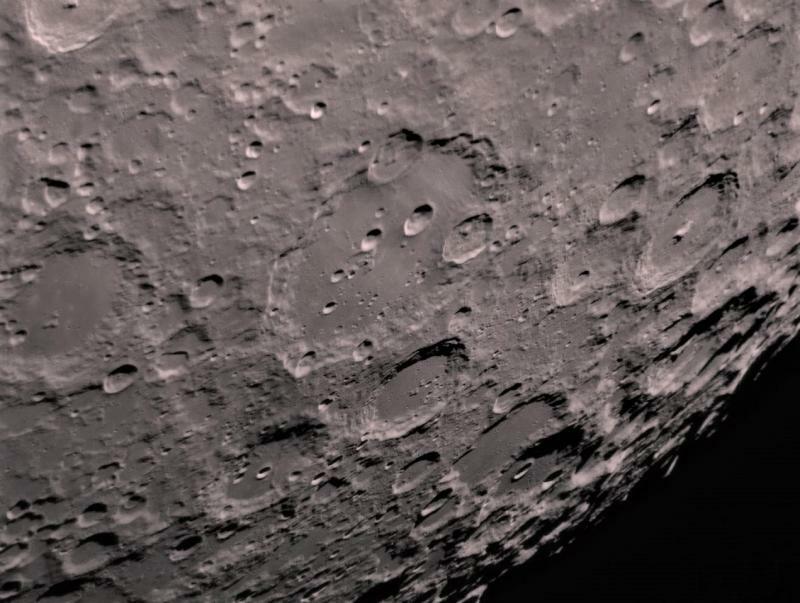 The smaller craters (or craterlets, as they're craters inside craters) just aren't showing up at all. This could equally well be a by-product of particularly mediocre (I hesitate to say 'poor', as poor is significantly worse than this) seeing. Maybe your C11 holds collimation better than most SCTs, but if you're carting it out and in every usable night, it's bound to have deviated slightly from true. Well worth getting familiar with one of the "quick touch-up" techniques to maximize your chances of really good resolution. Why 1/4? Is it the half that you mention squared? That said, you say 900, but it’s 807. Ah I get it, no Barlow, hence the half, and then the wavelength effect which is the other half. That’s the 1/4, right? I tried a Barlow on Copernicus but the result was dreadful. I guess the seeing wasn’t up to it . Thanks all for the comments folks, and the likes, much appreciated. Thanks especially for the comments re resolution. Not having been in a position to ever consider the implications of filters on resolution up to now, I have to my shame skimped over posts regarding such matters. I can now however appreciate first hand why capturing longer wavelength light results in a degradation of resolution. Resolution is directly proportional to wavelength through the relationship theta=1.22xlambda/D. Got that. So it really seemed that you're **** if you do don a filter (you'll lose resolution) and **** if you don't (you lose good seeing). As with all things astro it's another example of finding the best compromise, isn't it? Yeah exactly. 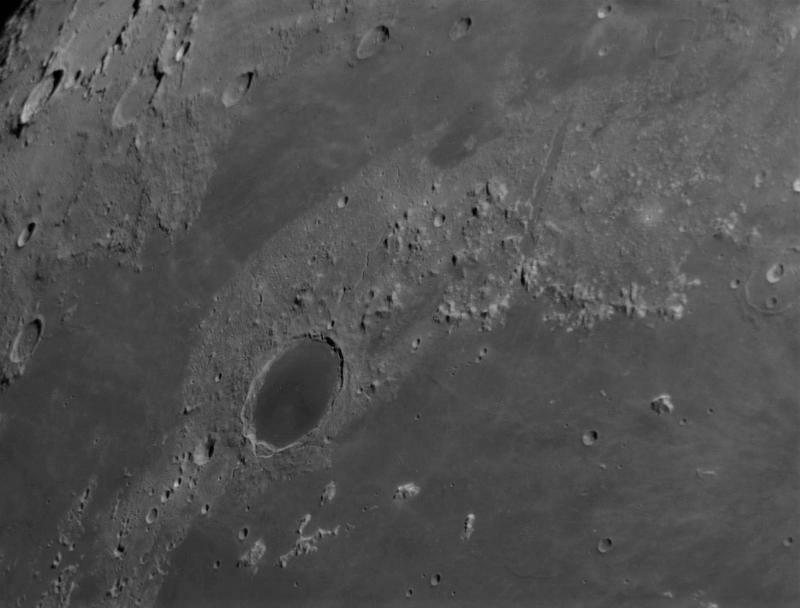 Most of the best resolution lunar images you see online seem use an R filter, as a good compromise. Ive seen a few taken with a G. One mindset is that if your best resolution is coming with an 807, its a bit of a s**t night. However at low altitude, or for other reasons, it can definitely give the best results and certainly has its place. Finally, I tend to collimate with the 807, so seeing doesnt mess with things. Ha ha. It was my best Lunar night ever - maybe all my nights have been s**t nights and this one was the s**tleast! I should have tried the 610 in hindsight. I’m trying to look up what their pass-wavelengths are. I bought this box of junk two years ago; I should have known better really. A nice set of images Kevin, and certainly very respectable! I'd be interested to know what your capture parameters were with respect to gain, exposure, frame rate, and how many frames you collected and then stacked. Your images look very natural, so there's nothing wrong with your processing, but as Grant said, there's a lack of fine detail for an 11 inch aperture. Most of this is simply due to the seeing, but I'm inquiring about the other perameters just to be sure there's not something else that can be done. As you know from my other post, I frequently use a green filter, and there has been some discussion of this in many of my threads (I know you said you glossed over those discussions in the past). When the seeing is good, then "green is good", but I don't know how often you will encounter this. I had a few days of bad seeing last week in which the Moon looked like it was under boiling water (I didn't post those images). That's fairly rare for me, but if that is what you (and many others) experience frequently, then there's just nothing you can do about it. The very highest resolution images are always associated with what most people would describe as varying degrees of "excellent" seeing. Under these conditions, even a simple screen shot with no processing should look amazing to most people. If that's not the view you are getting in the live window, and you can't see small craterlets and other features on screen, then you are doing well just to pull something respectable out of the muck. I'd welcome any help in improving the techniques I've cobbled together up to now alright. I'll stop there with the details. Seeing didn't allow for a Barlow. I dug up this info on these filters. Bar far the best on screen at least was the 807, which blocks the most atmospheric wobbling. Nothing I can do about the seeing anyway. Is my exposure time too short? Am I compromising quality in my zest for frames using high speed? 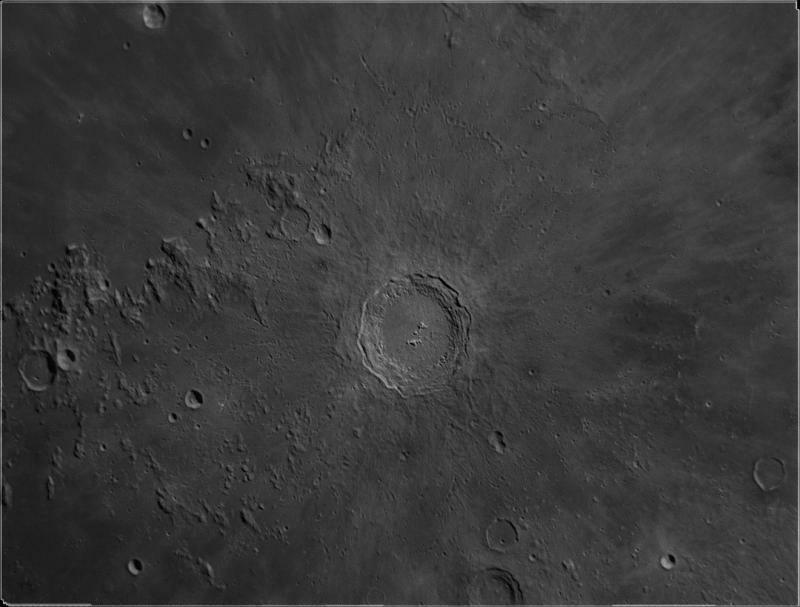 EDIT: One more thing - my Registax wavelet settings. Top wavelet: 80% to the right at 1.2 or so. Second from top: about 30% to the right, 1.2 or so. In doing this I clipped the histogram, which I know is frowned upon, but I deliberately did this as I felt the increase in sharpness warranted it. Edited by kevinbreen, 21 March 2019 - 09:31 AM. One thing - I notice youve got the classic colour balance settings for colour work (ie wblue ~95 and wred ~52). Bear in mind that for the 807 the sensitivities of R,G and B pixels are all much the same, and they're detecting the same light. So it makes sense to set these to 'neutral' or 50. In fact i found that 48,49 gave the best results (ie the most balanced responses in RGB, and least evidence of the bayer grid). Presumably you stacked the above as colour, or the bayer grid would be showing. The upshot is that some pixels are weighted heavily in the result and some are relatively ignored, which slightly harms your noise levels. Not much, but a bit. Also, having done this, you may be able to stack in 'greyscale' mode, though beware of the bayer grid showing through in which case revert to RGGB stacking as you currently are. Ah, I never considered that, Nick, cheers. Yes, I process as colour, then rendered the saved jpeg as black and white in Windows Photos (by reducing colour to min). I also brightened them slightly in WP according to taste. One thing I omitted to mention in my reply above to Tom, my Registax wavelet settings. I'd be keen to know the names of those mountains in the last pic. Kevin, I labelled a few items in your last image. The easiest way to identify an unknown region is to first consult the NASA libration page, which gives a simulated view of the Moon at any given time, properly accounting for libration. It was easy to scan the limb and find your region, which is located in the northeast section. You can then consult the LRO Quickmap and find names of the craters in the region, although on the limb this usually involves playing around with the 3D globe rendering and trying to get the view to match up, which isn't always easy. 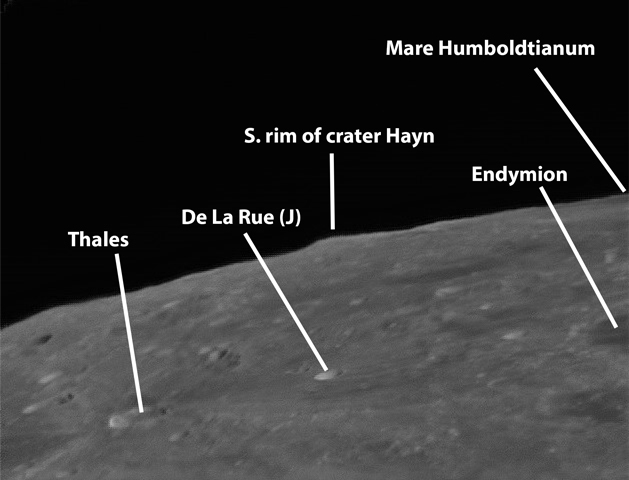 The large lava-filled crater Endymion, which looks somewhat like Plato when viewed in its entirety, is barely in your frame on the right edge. 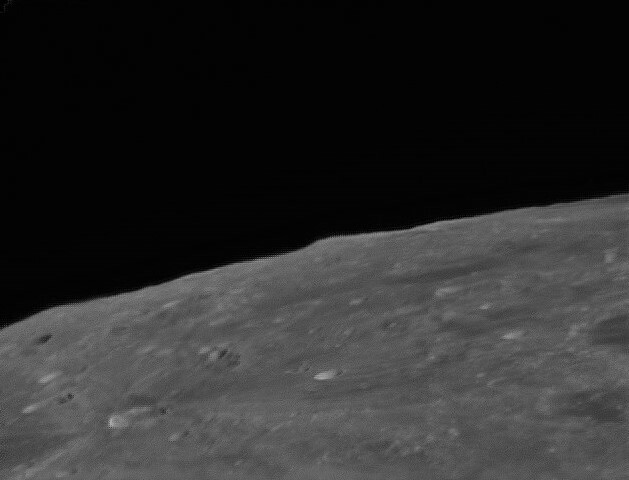 The prominent mountain peak appears to correspond to the elevated southern rim of the crater Hayn, which lies to the north of Mare Humboldtianum. Edited by Tom Glenn, 25 March 2019 - 03:47 PM. I don't know why i didn't post anything here, but if i have though then my question is, should i get IR807 filter while i already have IR742nm and soon i will get 610/685 ones? You said R filter for the moon, someone else recommended highly about Green filter, and then someone else told me that the best popular filter for lunar imagers is Light Yellow, i really got lost at which is really that best or favorite filter to be used for the moon no matter what camera or scope to use. Well now, that really is fantastic information, Tom, thanks very much. I sent the original pic to a hiking-enthusiast friend of mine suggesting he should go there next; now that I know the names of the terrain I might just convince him. Thanks also for the help on the BYEOS thread. I had looke it up myself also, but I couldn’t find a definitive answer.